Last month I killed a man… and now I'm afraid what I might do next. As a hypnotherapist with a special talent, I'm very good at getting people to overcome their problems. My own problem, however, is that my talent comes from a dark place. If I tell you to do something, trust me: you will do it. Most of the time I can keep things from getting out of hand, but when my emotions interfere, I lose control. That's when people get hurt, sometimes even killed. The only ones who know I've got a secret are my best friend Sukey and my boyfriend Sam. So far I've been able to keep them safe from the psychic cross fire, but what if one day I can't? Like now. Because now I find myself in the shadowy world of battered women and children, where I've met a little girl who's been violated in the worst possible way. As you can imagine, my emotions are about to interfere. Mercy Hollings is beating herself up over the death of man that she caused a month ago, and now she's afraid that her abilities may be from some evil source. She's helped so many people with 'the press', but how many has she hurt, and now, how many more will she end up killing? In Mercy's line of work telling people what to do is an everyday thing. When someone comes to her because they'd like to stop smoking, or eating too much, she can make them stop with a light 'press'. But when a woman shows up to an appointment with bruises from being abused, it's not so easy to tell someone what to do with their life. With the help from a local battered women's shelter, Mercy is able to help those women and children in need. It's satisfying for Mercy to know that she's making a real difference for these women, who seem to be nothing but fragile creatures. It's not so easy for Mercy though, when she's given the task of helping a women and child overcome their fears of an abuse so horrible it puts Mercy in shock. Will she be able to control her abilites, or will she 'press' the wrong issue? This was the second installment in the Mercy Hollings Series by Toni Andrews, and I'm glad that I ordered myself a copy of it to read. Mercy's abilities still amaze me, and I personally wish I could borrow them just a couple of times. I'm glad to see that Mercy is opening up more to the people that care for her, but wish that her relationship with Sam Falls would move forward. 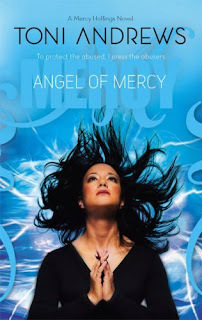 I'm very interested in reading the third novel in this series, Cry Mercy, to see if Mercy finds out more about her origins. I'm still waiting for my copy to arrive from the publisher, and have been checking my mailbox religiously in hopes of its arrival. Read my review for the first novel in the Mercy Hollings Series, Beg For Mercy. This book was part of the August Reading Challenge. I read the first one and it was amazing, I can't wait to read this one! I really like these. I can't wait for the next one! !